Leaders, especially superlative ones, are achievers. They get things done. They are typically hands-on, roll up the sleeves type of people who attack life and its opportunities head on. It is that sort of attitude that contributes to success, a tenacious, never say die pursuit of achievement. Typically they are labeled Type A, but I think type B personalities can be just as tenacious and relentless. They are just quieter about it. But, this attitude and inclination can get us into trouble. We tend to pick up too many things, lock in to too many pursuits, and want to fix every issue. If we’re not careful, we will be guilty of meddling or compromised in our ability to develop the skills and competence of others because we do things they should be doing. Doubtless, subordinates and associates will bring problems to you. Indeed, the competence to solve problems is imperative for superlative leaders, but I’ll write more about that next week. Right now I want to address this topic as a counselor. Some of you know that I donate several days a month to the local SCORE* chapter, a group of business men and women who mentor business owners or those who would like to be business owners. Of the many competencies found in our mentors, a universal one is we never take up a problem if it could and should be handled by the person we are mentoring. You do not develop people by doing for them what they must do for themselves. Imagine, if you will, that your workplace is a jungle. Indeed it may seem like one at times. Chaos, wild animals, and uncivilized behavior may occasionally be what you see most but usually things function naturally. People go about their business and the work gets done. To carry the analogy further, consider that each task, each responsibility, each problem is a monkey. Every person who works in the jungle has monkeys to take care of and usually they do. But when monkeys become troublesome and unruly, something happens that directly affects you. However, monkeys climb. They climb up the tree. And where is your desk (or main workplace)? That’s right. You sit in the higher reaches of the jungle. Troublesome monkeys are, well, troublesome. 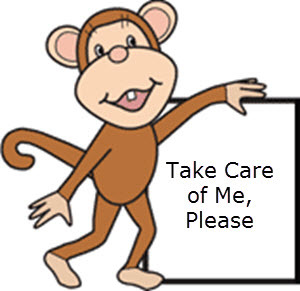 It is not unusual that monkey-tenders will hand off bothersome monkeys if they can. So the monkey may find itself on your desk or someone may bring it to you. JUNGLE SURVIVAL RULE #1 – Give monkeys back. 1. What is the problem? You want to know the nature of the problem itself. Almost always a subordinate or an associate will tell you the effects not the cause. You want to be able to identify the cause(s) and cannot be content with the effects only. Here’s the important part, you want to train the subordinate or associate to discover the cause. Do not treat effects only and do not allow those you lead to stop at effects. If you do the effects will surely and inevitably come around again. So, ask and keep probing until you get the answer and get the monkey-tender to be able to identify the problem and its cause(s). 2. What have you done about it? You want to know why the monkey is troubled, sick, or dying, and you want to know what has been done already. The answer will reveal much. You save time and eliminate guessing. You also begin to see the problem-solving skills (or lack thereof) of your co-workers. 3. What do you want me to do about? This sounds a little snarky but I don’t mean it that way. I am not suggesting you should answer sharply harshly or with a condescending manner. I do mean you should probe to find out what they want from you. A solution? Just to gossip? A reward for being an informant? Help? Advice? Or what? 4. What are your expectations in coming to see me at this time? While this may sound almost like question #3, it isn’t. A powerful component in the problem-solving process is attitude. The answer to this question reveals the level of hope, the degree of frustration, and/or the frame of mind, positive or negative. It begins to set the tone for what you have to do next? Well, you’ll have to wait until Monday to find out. I gotta go. There’s a monkey on my desk and he needs more bananas.